I am finding “The Billion Prices Project” to be valuable. Two of the most prominent benefits I see from the data include that data is available daily and it serves as a comparison and is plotted against the CPI (last available data) for references purposes. The current (as of 11-22-10) “Billion Prices” index value for the U.S. is 100.51. As well, data is available for a number of countries. This entry was posted in Uncategorized and tagged cpi, Inflation on November 24, 2010 by Ted Kavadas. In Friday’s post, I mentioned consumers’ migration to lower-priced stores. In the accompanying graphic, it shows how long it took the other fastest companies to grow to $1 Billion in sales. Interestingly, of the eight fastest listed since 1995, every one – with the exceptions of Yahoo and Google – have a business model focused on offering (highly) discounted goods or services to consumers. This entry was posted in Business, Uncategorized on November 22, 2010 by Ted Kavadas. I found two especially notable items in Walmart’s Q3 conference call transcript (pdf). I view Walmart’s results as particularly noteworthy given their retail prominence and focus on low prices. I previously commented upon their results in the May 20 post. First, from page 13, “Comp store sales for the 13-week period, which ended October 29, declined 1.3 percent…” Although I didn’t see it mentioned in the transcript, this was the 6th straight quarter of drops. One factor that may be fueling this decline is that apparently lower-price rivals – such as “dollar” stores and Aldi stores – are impinging on sales. Although it is not clear to what extent this is happening, I think from an overall economic standpoint it is very telling – and at least somewhat alarming – that a significant number of people apparently are seeking lower price alternatives to Walmart. everyday Americans, including many of our core customers. The paycheck cycle is still pronounced for these customers.” This “paycheck to paycheck” condition is something I have discussed in the aforementioned May 20 post as well as the September 23, 2009 post. While it is not something that receives a lot of mention – and statistics on it are difficult to find – I feel that it is nonetheless important as it highlights strains in, among other things, household finances, affordability, and standard of living. This entry was posted in Uncategorized and tagged paycheck to paycheck on November 19, 2010 by Ted Kavadas. Gallup has a variety of economic surveys that I find interesting. At each link, details of each survey are presented. These charts, along with other Gallup economic surveys, should be interesting to monitor going forward. Although I believe that (economic) surveys, in general, should be interpreted with caution, these Gallup surveys appear to provide a valuable additional perspective on various economic aspects. 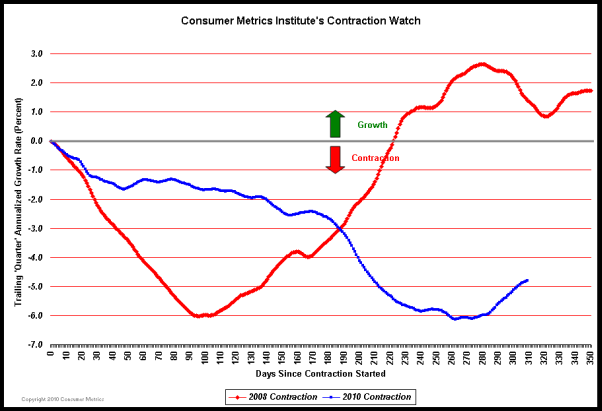 This entry was posted in Economic Forecasts and tagged Consumer Confidence, Economic Forecasts, Gallup on November 18, 2010 by Ted Kavadas. 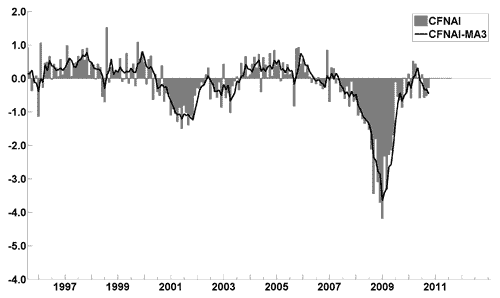 The Philadelphia Fed Fourth Quarter 2010 Survey of Professional Forecasters was released on November 15. This survey is somewhat unique in various regards, such as it incorporates a longer time frame for various measures. As for “the chance of a contraction in real GDP in any of the next four quarters,” estimates range from 11-13.8% for each of the quarters through Q4 2011. As well, there are also a variety of time frames shown with the expected inflation of each. Inflation is measured in Headline and Core CPI and Headline and Core PCE. Over all time frames expectations are shown to be in (or very close to) the 1-2% range. This entry was posted in Economic Forecasts and tagged Economic Forecasts on November 17, 2010 by Ted Kavadas. The November Wall Street Journal Economic Forecast Survey was published November 15, 2010. I found a couple of items to be especially interesting. 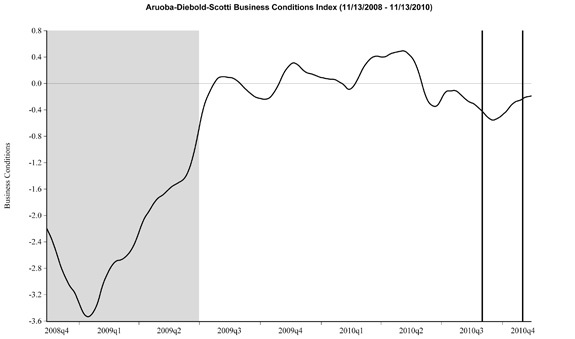 This entry was posted in Economic Forecasts and tagged Economic Forecasts on November 16, 2010 by Ted Kavadas.